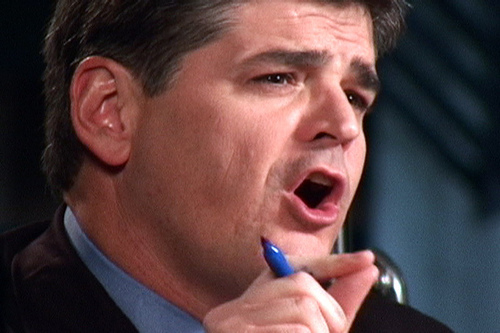 One of Sean Hannity's greatest skills is to rant his monologue while making it appear to be a question. I'm not entirely sure why he does this so often. I used to think he just did it to people who might serve him up a smack down and it was his way to run the clock out, but he even does it to people like Karl Rove so I'm at a loss. It could just be that his massive ego requires him to fill up more than half the air time on the show, or, as I am starting to believe, it is so that he spew out a bunch of non-sequitors to communicate something to his audience. Tonight he was talking with Karl abouthow McCain can win the necessary 270. When they discussed Pennsylvania Sean once again brought up the comments Senator Obama made back during the primaries about the folks who cling to guns and religion. He spent about 20 seconds rehashing this comment and then finished it up with asking how, after hearing something like that, could the people of PA ever vote for him. Ed Rendell did a decent job of stuffing it back at Sean and before Sean could do his typical interruption Rendell shut him up by pointing out he hadn't interrupted Karl Rove.